Almonds, blueberries, apples, melons – all of these fruits, and many more, rely on insect pollination. Some crops rely more on pollinators than others. Insect pollination isn't just about the number of fruits produced – it can also improve the quality of the yield. For example, self-pollinated flowers may produce a fruit, but it might be very small or misshapen. So how do farmers make sure their crops will produce enough fruit to make a profit? Crops in most parts of Australia have one main blooming period, usually in spring or early summer. The window for pollination usually lasts two to four weeks, depending on the crop. During that time, insects need to be flying around visiting flowers to feed on pollen and nectar to ensure that pollination happens. To optimise yields, most growers rent European honeybee hives during crop flowering season. Honeybees were first introduced to Australia from Europe in the early 1800s. Today, the beekeeping industry includes around 600,000 managed hives and is worth around A$100 million to Australia's economy. But it's not just about honey and beeswax products. Managed crop pollination services have become big business in many parts of the world, including Australia. Although most beekeepers do still keep bee hives to produce honey or wax products, paid pollination services are becoming increasingly important to the industry. In Australia, the almond industry is one of the biggest renters of honeybee hives for pollination. Almonds bloom for a few weeks at the end of August and rely almost completely on insect pollination to produce harvestable almond fruits. The many plantations across northwestern Victoria rent more than 150,000 hives each year, costing millions of dollars in rental fees. Costs per hive vary depending on the crop, covering costs to the beekeeper such as how far they have to travel, the time of year (early season pollination can be more stressful for honey bees and require more feeding costs for beekeepers to maintain hive health), and the risks (e.g. chemicals) bees might face in the crop. 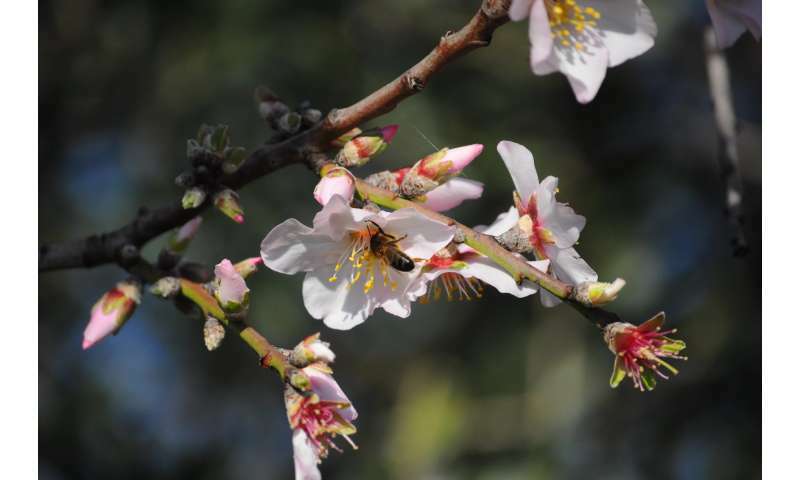 For almond pollination, one hive can cost around $70-100 to rent. Some growers rent hives by contacting individual beekeepers directly. But many corporate growers will hire a pollination broker as a go-between to organise the complex logistics of trucking thousands of beehives from interstate to be there at just the right time. Delivering bees too early or too late can impact the health of the honeybee colonies, or result in lower crop yields. The beekeeper and grower usually sign a pollination agreement, in case there are any problems. For example, a beekeeper can specify that the grower should not spray pesticides that can damage the colony's health while the hives are in place. Honeybees naturally return to their colony at night, as they rely on daylight and warmth to forage. This makes it easier for beekeepers to transport hives when needed. At night, when all the bees are at home, hive entrances can be shut off to stop them escaping during the journey. Beekeepers load their hives onto a truck and drive thousands of kilometres to the plantations. They leave their hives dotted throughout the plantation just as bloom is starting, and return to collect them at the end of flowering. Because beekeepers collect their hives at night, it's unlikely that many bees are left behind. If an individual does get lost, it won't survive long on its own, as individual honeybees rely on the colony to stay alive. Alternatively, crop growers can buy their own hives and set them up permanently, eliminating the cost of rental and reducing the pressure on honeybees used for pollination services. However, this comes at its own cost. Growers need to maintain the beehives themselves or hire a beekeeper to do it. Many small-scale growers do this really well, and diversify their business with another product (honey). But the practice is less economical for larger-scale growers. Native stingless bee species are another option for some growers. These bees live in colonies and make honey, just like the introduced honeybee, and can also be managed as pollinators. There is a growing stingless bee pollination industry in eastern Australia supplying rented stingless bee colonies to crops. However, these bees aren't naturally found throughout much of the southern and inland parts of Australia, where conditions are less suitable for them. There is lots more research to do to understand the full potential of using stingless bees on a larger scale. For example, we need more data on how these native bees improve fruit set in a variety of commercial crops, and we need greater understanding of how transporting stingless bees to regions outside their natural range for pollination services might affect colony health. There are also thousands of native pollinators in Australia, including around 2,000 native bee species and thousands of flies, wasps, butterflies and other insects. We already know many of these are capable of pollinating our major crops, including almonds. This means they are providing pollination services for free. Some can be more effective crop pollinators than honeybees. But we still know very little about these wild pollinators. In particular, some of the ways we manage our agricultural landscapes, such as broad-scale monocultures, habitat clearing and overuse of pesticides, can have damaging effects on pollinator populations. Most crops benefit from a variety of insect pollinators, not one single type. It's financially and environmentally risky to rely on a single bee species for all our food production. Ideally, we need to build understanding of how to manage landscapes sustainably to support multiple pollinators.